Today, I wanted to take a break from working on P5Serial. Last year I got a bunch of NodeMCU ESP8266 boards and I haven’t really utilized them yet. I set out to do a simple entry task.. turn off and on an LED with a browser. First thing I have to is set up my programming environment for the NodeMCU. I am using vscode as my editor for arduino, and while the arduino extension recognizes the nodemcu, uploading wasn’t working. So I opened the arduino ide and installed via the ide as well. Open up preferences and add the official url: http://arduino.esp8266.com/stable/package_esp8266com_index.json. Next install NodeMCU with the board manager and we’re grooving. First things first is to connect the board to wifi. Here at ITP we have WPA Enterprise making it quite difficult to connect to the internet. Fortunately there is a network that I can use for my IoT devices. However I have to register my device using the MAC address. 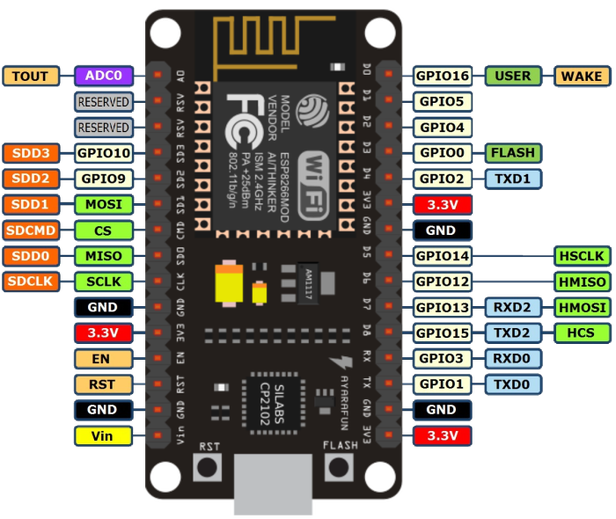 To find the board’s mac address I have to use the ESP8266 WiFi Library. Make sure you are using the correct baud rate for the serial monitor and your upload speed. In my case 9600. Next step is to code the board. I’m starting a webserver on my board and connecting via my computer to turn off and on the led. The interface looks like: Sweet! Can I register a router start a network and connect more devices with that network? I attached a servo to my micro controller and can control it via browser as well.